Add the remaining vegetables and chicken and continue to cook and stir until water is evaporated. If they are not soft then add a little more water and continue to cook. Stir in creme fraiche and chive and serve with sour dough baguette. Jacquelyne Aubuchon is a guest contributor to this blog and a loving sister and aunt to the residents of Chism Heritage Farm. You can contact her at Jacquelyne@sew4cons.com or keep up with what she is doing at City Roots and Fruits. 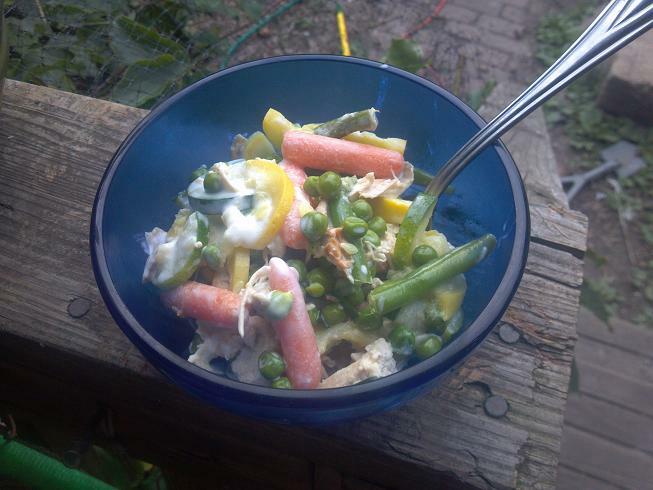 This entry was posted in Recipies and tagged chicken cream vegetable recipe, vegetable recipe. Bookmark the permalink.